Medical devices maker NuVasive has obtained 510(k) clearance from the US Food and Drug Administration (FDA) for its CoRoent cervical interbody implant system. CoRoent small interbody system has been approved for intervertebral body fusion at multiple contiguous levels in the cervical spine. NuVasive’s CoRoent is an an interbody cage, which is produced by using PEEK-Optima that stabilizes spinal motion segment while fusion occurs. A hollow core enables for packing of autogenous and allogeneic bone graft, which includes cancellous, cortical and corticocancellous bone graft material that allows in better fusion. Rows of teeth on the surface of each end of the device will enable to have grip on the adjacent vertebrae to support migration and ejection of the device, which includes marker pins with titanium alloy or tantalum. The implants in the CoRoent system include CoRoent small (S), CoRoent small lordotic (SL), CoRoent small lordotic plus (SLP), CoRoent small hyperlordotic (SHL) and CoRoent small contoured (SC). NuVasive president and COO Jason Hannon said: “This FDA 510(k) clearance is another key milestone for NuVasive as we continue to deliver new innovation to the spine market. Last year, NuVasive acquired healthcare organization Biotronic NeuroNetwork for around $98m. Established in 1982, Biotronic offers intraoperative neurophysiological monitoring services to surgeons and healthcare facilities across the US. NuVasive provides minimally invasive and procedurally-integrated spine solutions, including access instruments, implantable hardware and software systems for surgical planning. 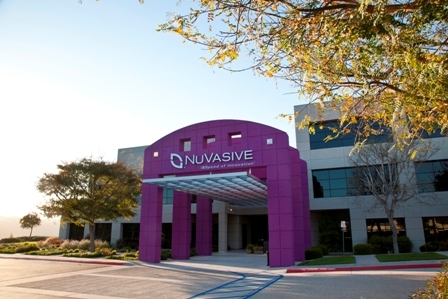 Image: NuVasive headquarters. Photo: courtesy of NuVasive, Inc.